This evening I was tired when I got home. I'm still not feeling well and haven't really had much of an appetite. I wanted to make something simple and tasty for dinner. The only "flavors" that seem appealing to me now are salty, sweet or spicy because they actually taste like they are supposed to. I rambled through the fridge and found a package of boneless chicken thighs and pulled them out and grabbed the opened jar of artichoke hearts from the fridge. 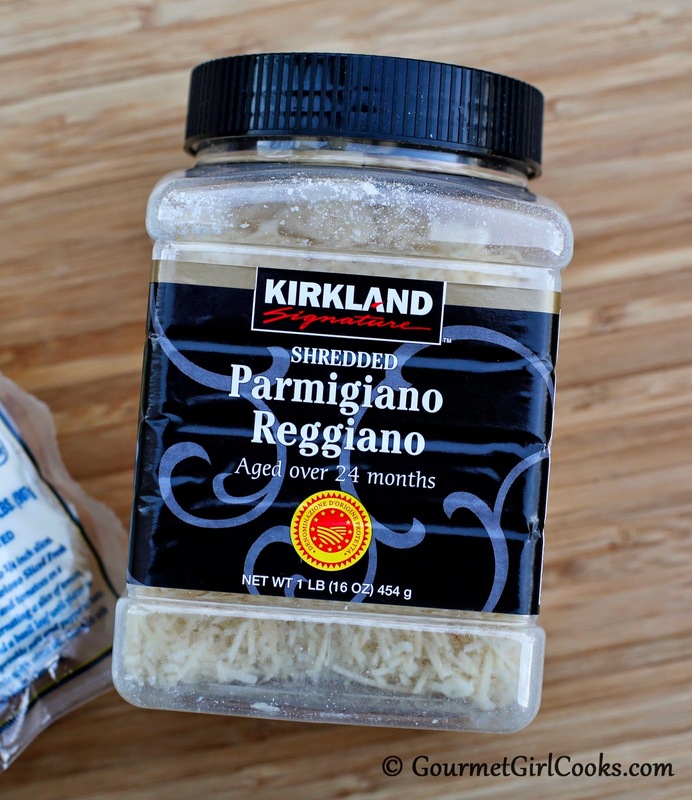 I also grabbed a jar of DelGrosso's Fireworks pasta sauce, a package of fresh mini San Marzano tomatoes, the fresh mozzarella cheese and shredded Parmigiano Reggiano. I decided I would make something simple and easy with those ingredients. I heated olive oil in my heavy cast iron dutch oven and seasoned the chicken thighs on both sides with salt and pepper and browned them for about 5 to 7 minutes per side and then poured about half a jar of pasta sauce over the top of them. I sliced the tomatoes in half lengthwise and scattered them on top of the chicken and sauce and then added about 1 cup of artichoke hearts on top and seasoned with red pepper flakes, covered the pot and popped it into the oven to bake for 30 minutes. 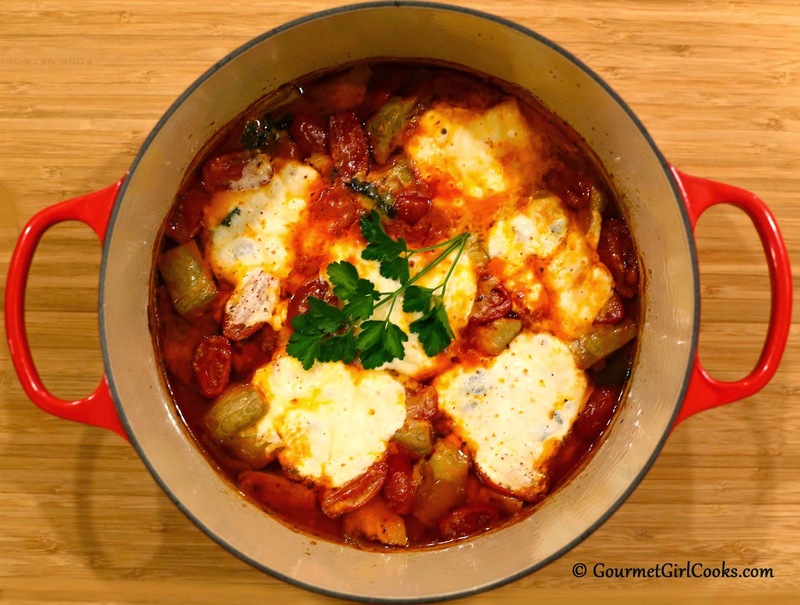 I pulled it out and topped it with the sliced fresh mozzarella and the Parmigiano Reggiano and placed it back in the oven to bake for an additional 10 minutes until the cheese was hot and bubbly. I topped it with fresh parsley and served it. It was unbelievably delicious. It was spicy and the chicken was fork tender. I had thought about serving it on a bed of zoodles but decided to keep it simple and eat it "as is" and I'm glad I did. It was wonderful and like a hearty Italian style stew. I snapped a few photos below as well as the easy peasy recipe. Enjoy! Preheat oven to 350 degrees F. In a large oven safe dutch oven, heat olive oil over medium high heat. Season chicken thighs on both sides with salt and pepper, to taste. Brown 5 to 7 minutes per side until light golden brown. Pour pasta sauce over top of chicken. 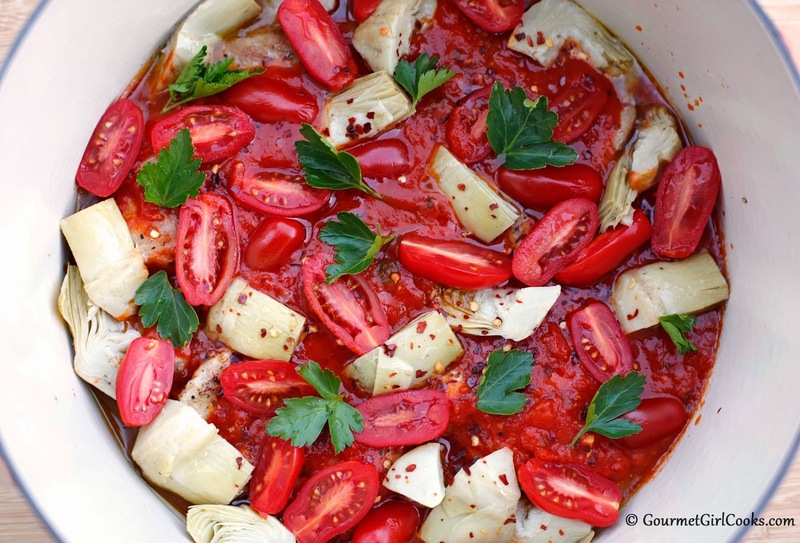 Scatter tomatoes and artichoke hearts over top. Season with red pepper flakes. Cover and bake for 30 minutes. 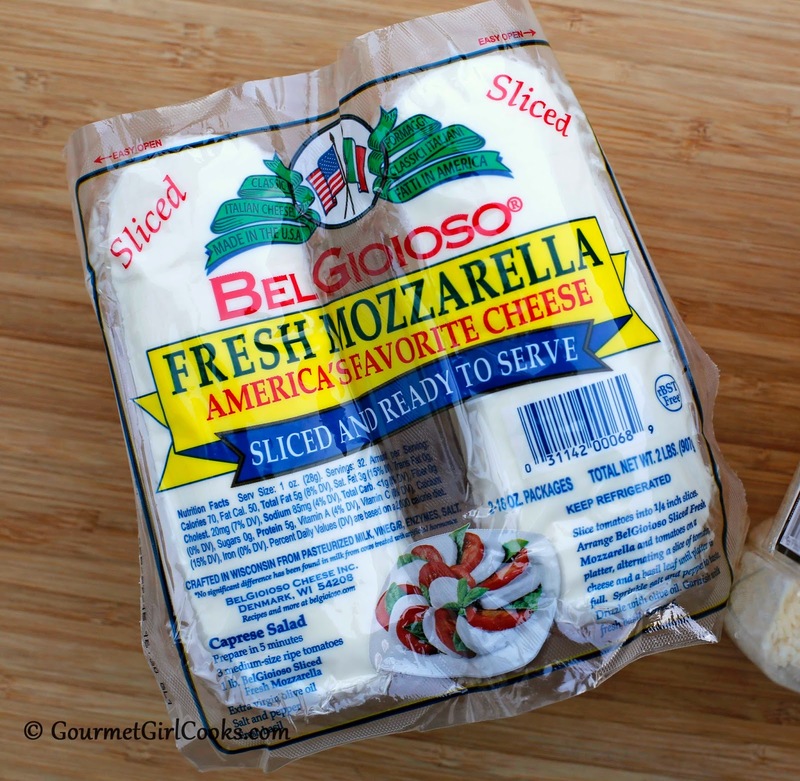 Remove from oven and top with mozzarella and Parmigiano Reggiano; bake an additional 10 minutes until hot and bubbly. Top with parsley and serve. Gosh, GG I'm so sorry to hear you are still not feeling well. I hope you start feeling better soon. 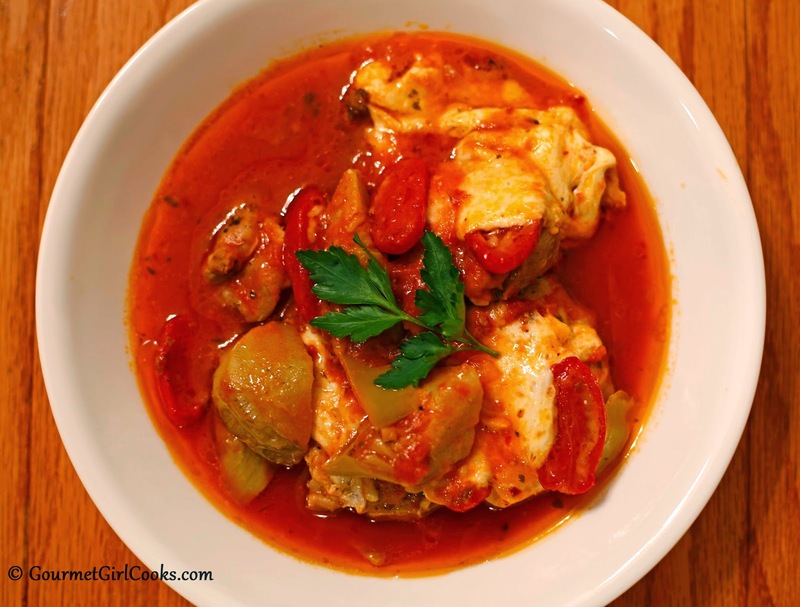 The Chicken w/Artichokes & Tomatoes recipe sounds yummy. This dish looks scrumptious ... so simple to put together, too. And it's perfect for this freezing cold weather and for soothing a case of the "blahs." I'm sorry you're still under the weather. I know a lot of people who have had illness hang on and on and on this winter. Spring will be here eventually and hopefully the viruses will magically vanish. It's Friday ... my favorite day of the week. :-) Hope you're able to get some rest and pamper yourself this weekend.